Less than seven hours after being asked about the racist legacy of rock entertainer Ted Nugent, the Coeur d’Alene Tribe of American Indians this evening cancelled a scheduled performance next month by the controversial performer. Tribal officials sounded completely caught off-guard earlier in the day when Hatewatch called and asked why the tribe – with a sterling record of combating hate and standing up for equal rights – had booked Nugent. “The Coeur d’Alene Tribe has always been about human rights – for decades, we have worked individually and as a Tribe to make sure that each and every person is treated equally and with respect and dignity,” the statement said. Chief Allan, Chairman of the Coeur d’Alene Tribe, issued a one-sentence statement about the cancellation, without explaining how Nugent got booked in the first place. “We know what it’s like to be the target of hateful messages and we would never want perpetuate hate in any way,” Allen said in the statement. Laura Stensgar, the executive director of marketing for the tribe’s Coeur d’Alene Casino, apparently either made the decision or oversaw someone who booked Nugent. 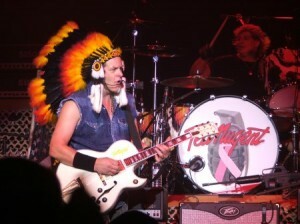 Many of his racist remarks have been made from the stage during rock performances, during which he sometimes wears an Indian headdress. “Unfortunately, when we booked him, we were looking at him from an entertainment perspective, as an 80s rock ‘n roller, who we thought folks might enjoy,” Stensgar said. “We take the comments and concerns of our community very seriously and we apologize to anyone who was offended by the idea that we would promote these kinds of attitudes. We will do our best to avoid such mistakes moving forward,” Stensgar added.